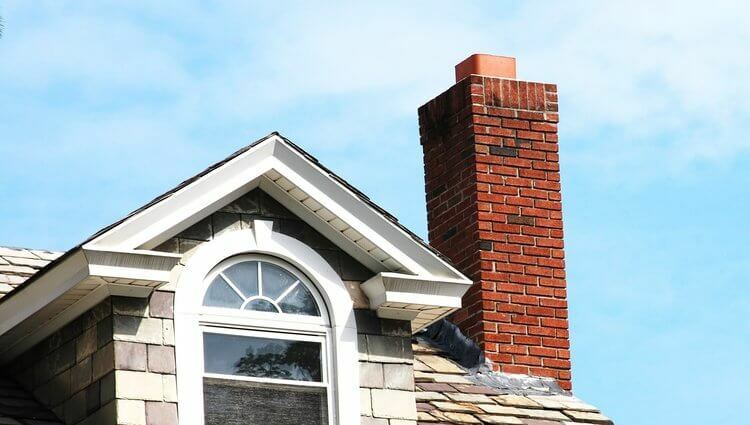 Chimney Repairs: The Complete Guide - Brick Restoration, Inc.
With chimneys and fireplaces, repairs and maintenance are inevitable. No matter the age or design you may have, it’s almost certain your chimney or fireplace will experience some issues that require maintenance or repairs. 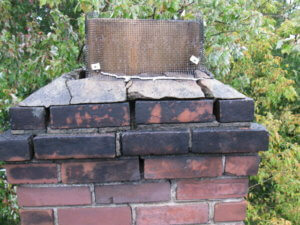 Even a bird’s nest in your chimney can cause you some considerable & costly problems. The major reasons behind chimney issues will definitely vary but in this article we’ll cover their most common problems and the causes. A masonry chimney can be made up of a variety of materials including bricks & mortar, concrete, block, stone, flue tile, cast iron and steel. These different materials can be extremely vulnerable to rainwater and other elements if not properly installed or maintained. Any external hazard can cause considerable aesthetic or physical damage to these extremely porous chimneys. For these reason’s it’s vital to keep an eye on your chimney. 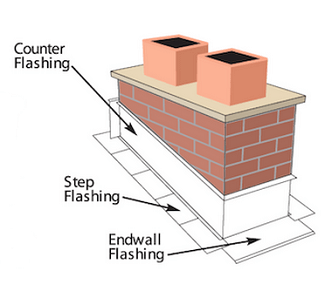 Before we dive into common repairs, here’s an infographic on the components of chimneys. 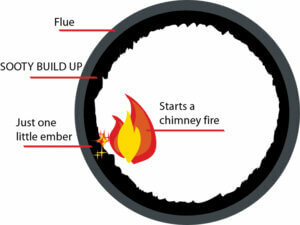 Now you should have a basic understanding of the different components that make up your chimney. Don’t worry if you still feel lost because we’re going to cover everything in much more detail. Let’s dive into what can actually go wrong with your chimney and/or fireplace. Cracks in the crown or firebox are even considered a fire hazard by the NFPA (National Fire Protection Association). The reason is because when a chimney is being used and smoke is emitted, it carries waste particles from the fire. This is the black smoke you see leaving a chimney when it’s in use. These waste particles build up and can get accumulated on the interior walls of the chimney and especially in any cracks there may be in the masonry. 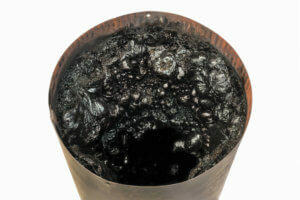 The picture below is an example of a pretty severe buildup in a chimney flute that is a definite fire hazard. The masonry cracks essentially become little pockets of waste particles and carbon buildup, some of which is flammable. The real culprit is an oily substance called Creosote which is similar to soot except that it can be reignited from sparks. If there is considerable buildup of Creosote, it could be ignited by a rogue spark when the fireplace is in use. Creosote is a flammable substance that starts off as a residue of smoke and vapors from burning wood. 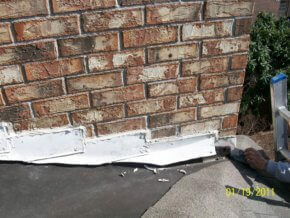 It clings to the venting system as it builds up as hard and flaky deposits. For an in-depth article on Creosote, click here. It is recommended that a chimney cleaning be performed when either soot or creosote buildup reaches ¼ inch or more. 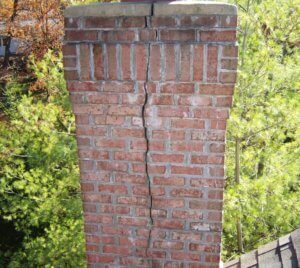 Fire hazards are one of the biggest reasons to monitor the mortar of your chimney and fireplace for cracks. In fact, there are over 61 house fires caused by dirty chimneys per day in the United States. If you do find some cracks in your chimney or fireplace, don’t panic. We fix these types of fireplace cracks all of the time, however, don’t wait too long to have it repaired as the potential for damage could worsen. 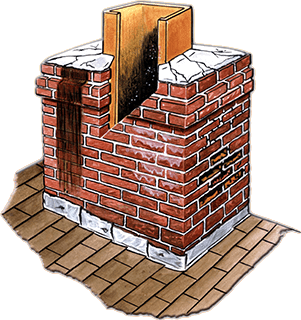 There are multiple entrance points for water penetration to occur and water entering the chimney can give rise to several big problems. Aside from the usual devastation and mold that water penetration can cause, it also has another scary result. When water mixes with the creosote it becomes acidic which, in turn, causes premature rusting of the damper and speeds up the deterioration of the brick and mortar in your chimney & fireplace. Keep in mind that water can enter the chimney through any cracks in the crown or in the chimney shelf itself. It can also enter because of faulty flashing where the chimney meets the roof. This water can not only cause the decaying of the exterior mortar but can also extensively damage interior walls and structural elements of your home. All of these hazards can be avoided by keeping a regular chimney checkup schedule and ensuring that there is no room for water infiltration in any part of the chimney or fireplace. The chimney crown is the top element of the chimney which itself acts as a shield from a number of dangers. It covers the chimney from the flue liner to the chimney edge. The crown should have a downward slope which directs the water away from the flue edge. It must also have an overhanging drip edge which must direct the run-off from the crown away from the chimney in order to ensure that there is no erosion of the brick and mortar in the vertical surfaces of the chimney. 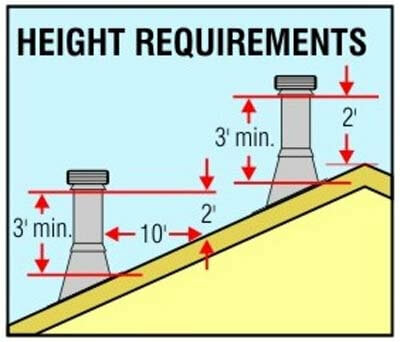 A proper chimney crown should be constructed in an overhanging manner of a Portland cement-based mixture and should be beyond all sides by a minimum of two inches. ‘Flashing’ means sealing the area between the roof and the chimney which will prevent rain water or snow melt from going down into the house. It can act as a huge safeguard for the ceilings, walls and floors which would otherwise be damaged extensively every time it rained. It’s basically an expansion joint between two dissimilar materials. 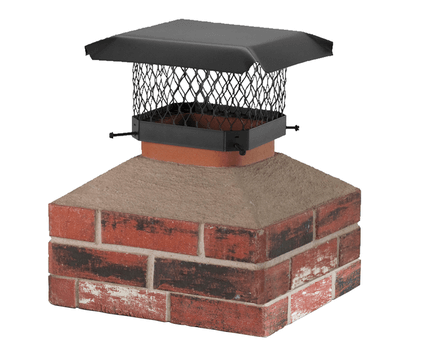 It comes with the ability to allow both the roof and the chimney to expand and contract at their own rates without causing any problem to the waterproof seal. Above is a real world example of flashing on a recent construction home that has failed and been allowing water to penetrate the house. Very few residential masonry contractors are actually qualified to build a masonry chimney, which means that most of them will unknowingly set you up for failure. 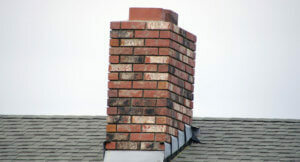 There are two major construction flaws that commonly cause issues for chimney owners. The first being the chimney might be too short to prevent downdrafts. The areas between the lintel and throat are not tall enough to allow the smoke to “roll” before it enters the smoke shelf. 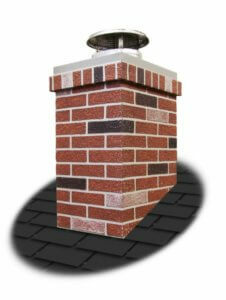 A cap is essential for any chimney because without it the water will be pouring right into your fireplace. It will also prevent birds and squirrels from making their way into your house through the chimney opening. It essentially keeps out debris you don’t want in your house like leaves. Like any other building material, brick and mortar are subject to deterioration after exposure to the elements over a certain period of time. The external elements gradually degrade the walls of the chimney. If your chimney is to the point of major deterioration and is crumbling, then it is time to rebuild because the bricks and mortar have crossed their survival limit. If your chimney is leaning even just slightly. 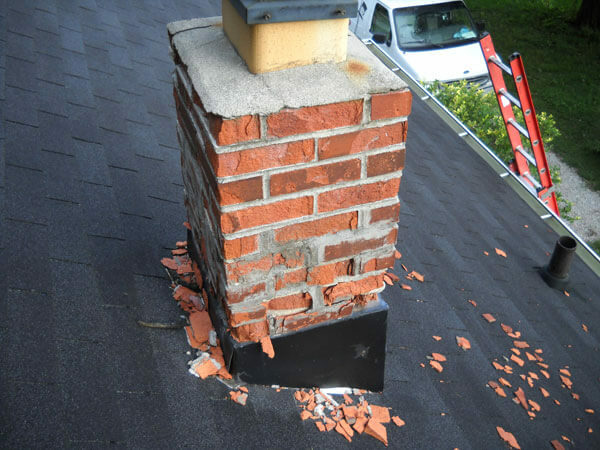 Call a professional to further assess the issues, as a leaning chimney could be in danger of collapsing and causing extensive damage to your property. In conclusion, this is by no means an exhaustive list of the problems that you can encounter with your chimney or fireplace but just the most common issues that we find. We always recommend an annual professional chimney inspection, to not only guarantee your family’s safety but to also prevent major costly repairs down the road. Remember to keep an eye out on your chimney & fireplace and visually inspect it monthly to ensure that there are no immediate issues. A monthly 5-minute visual checkup could save you thousands in chimney and fireplace repairs. Visually inspect the fireplace hearth for any loose bricks or cracks. Visually inspect the firebox to make sure it has no cracked or damaged bricks. Check the damper to make sure it is operational. Visually inspect the exterior chimney for damage or cracks. Repair any cracks or damage before further operation of fireplace. We hope you found this article helpful on the common issues you may face with your chimneys and fireplaces. If you have any questions, concerns or just want to get a second opinion, don’t hesitate to reach out to us and we’ll help in anyway we can. If you’re in the Greater Houston Area and are in need of a professional chimney inspection, we recommend Lord’s Chimney Services . Disclaimer: Brick Restoration is not being compensated for any referrals or recommendations made on our website. If we recommend a business, it’s because previous customers have reported a good experience. Your results, however, may vary. My chimney has a huge crack in it. I had no idea that not cleaning my chimney could lead to it breaking. I wonder if the inside of my chimney looks like the one with all the suit in it. My wife and I will have to see if we can have someone come out this week and fix it for us. Hey Jon, Don’t worry you are far from alone and who can blame you. It’s easy not to think about your chimney like that. Don’t hesitate to reach out for your appointment, we’re here to help!